If you need a Sony finalize dvd disc and video recovery service, then contact our friendly company. 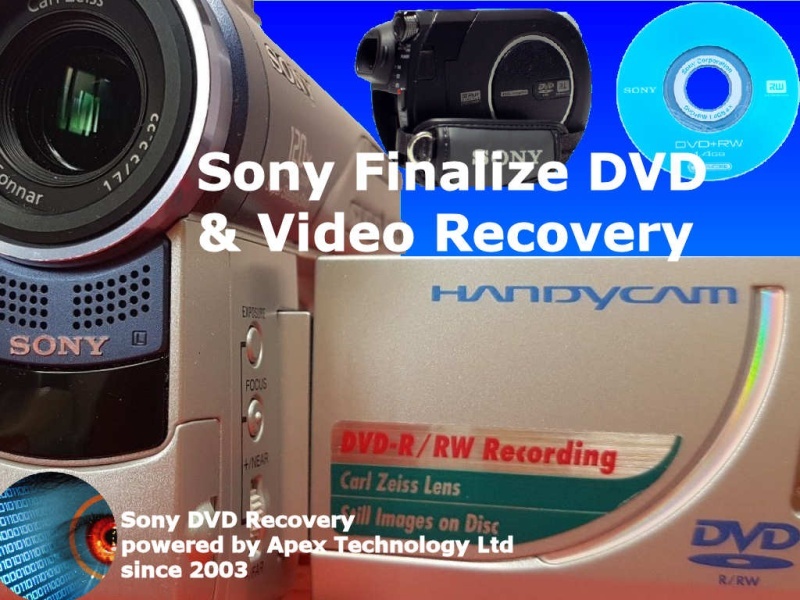 Do you need to recover the video from a Sony Handycam dvd disc? Then simply contact s by phone or email. The Sony Camcorders are the most popular we get for recovery. Recovery of the video is possible for many problems such as ... Camera knocked or jolted as video disc was being finalized. Playing the DVD on the Handycam, Disk Error - remove disk C:13:02 appears on the lcd screen. Error code C:13:00 and the disc is dirty. During DVD finalisation an error about the disk door being open followed by Unsupported format error. Disk appears empty and won't play the movie. All old recordings disappear! Sony digital Video Camera model DCR-DVD905 - mini DVD suddenly can not be read and has this error after accessing " C:13:02 disc error". DCR-DVD301 finalize Sony DVD-RW disc, "Access Error" on the LCD screen .